The Inkscape developers are hard at work developing the new version of Inkscape (0.91). This post is part of a series that will outline some of the awesome new features that will be available when Inkscape 0.91 is released. Previously, to change Inkscape’s keyboard shortcut configuration to another one of the included presets involved moving files around in the Inkscape config directory. 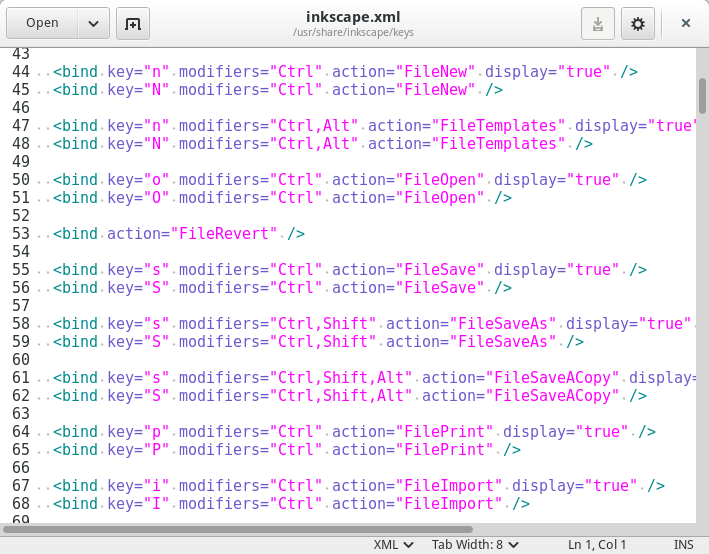 Configuring your own keyboard shortcuts required you to hand-edit an XML file like this. In Inkscape 0.91 there is a brand new keyboard shortcut editor (under Interface > Keyboard Shortcuts in the Preferences Dialog). This addition provides a GUI for the user to view the key combinations available in the current shortcut scheme, switch between the included preset schemes, and edit and change individual shortcuts. If you want to try out this new feature already, you will need to Download a “nightly” or “development” version of inkscape. Links to various builds of development versions of inkscape are listed at the Inkscape downloads page.